means it goes into coma, after the end of massive star formation. From what I've read, the transition to the pseudo-ring structure from a potentially near-pure spiral structure is theorized, and modeled, to be the direct result of a collision with M32. No doubt the collision perturbed star formation within M31, but the ring structure is not currently viewed as an evolution to a lenticular due to the end of star formation (if that's what you were implying). I really think that the starforming "spiral rings" of Andromeda in today's APOD truly look like breaking waves, spreading outwards after a bull's-eye "splash". Except M32 hasn't really hit yet, as far as I can understand. Maybe we will see some real fireworks when it hits for real - or our descendants may see it, if we are lucky. Is Andromeda in the process of turning into a lenticular galaxy? Actually M31 is a quite red galaxy, and redder than most of us think it is. Our big sister galaxy is close enough that we can easily make out "her" star forming regions, especially when it is photographed through an Ha filter. We can also see the blue stars in the spiral "rings". But in reality M31 is rather poor in star formation, and its colors are red: 0.92 (B-V), and 0.50 (U-B). This is comparable to many elliptical galaxies. One example is NGC 1316, an elliptical galaxy that contains dust but no visible regions of star formation. Yet, the colors of NGC 1316 are actually very slightly bluer than the integrated colors of Andromeda. NGC 253. Photo: R. Jay GaBany. Some spiral galaxies are also about as red as Andromeda, but they are usually quite dusty, and hide regions of star formation behind dust. 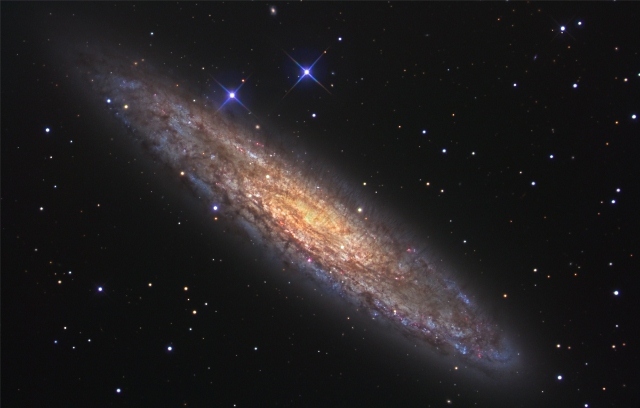 On example is the Silver Dollar galaxy, NGC 253. The integrated colors of NGC 253 are somewhat bluer than the integrated colors of Andromeda, but while Andromeda is dust-poor - it is about 1.3 magnitudes fainter in the far infrared than in blue light - NGC 253 is almost 2.5 magnitudes brighter in the far infrared than in blue light. There are many brilliant blue stars in NGC 253 that are hidden behind all that dust. To summarize: M31 is a red galaxy, poor in star formation, with huge numbers of old red stars, but with rather little dust. Is it on the way to becoming a lenticular galaxy? I'd say its star forming ability is definitely winding down. I think this is the first time I have noticed distortion in M110....there seems to be "tidal pull" towards M31. It says we look very much like M31...I think we have more defined spiral arms than M31 at least from some depictions. M31 seems very thin. This is a VERY nice shot of M31. Boomer12k wrote: I think this is the first time I have noticed distortion in M110....there seems to be "tidal pull" towards M31. Totally agree. This is a fine shot even though the galaxy is winding down. APOD Robot wrote: Much about M31 remains unknown, including exactly how long it will before it collides with our home galaxy. I thought the time frame had been estimated to be 4 billion years?! Yeah you're right, there aren't enough images of M42! Although I can understand your point of view but I find it insulting of you to describe M31 as a boring galaxy, not only is it beautiful but it is also astronomically important. Out of curiosity, what things beside M31 would you want to see on APOD? Me personally would want to see more planetary nebulae and also deep sky objects in catalogues other than Messier and NGC. Or perhaps just another picture by Robert Gendler, because he has produced such a wealth of astroimages. Or maybe one by R. Jay Gabany. Or how about one by our Starship Asterisk* stalwarts. There are many of them that deserve an APOD! Assuming M 31 is 2 million (or more) light years away, and we are, in fact, looking at the galaxy the way it was 2 million years ago...where (or how close to us) is it now?! jaypek wrote: Assuming M 31 is 2 million (or more) light years away, and we are, in fact, looking at the galaxy the way it was 2 million years ago...where (or how close to us) is it now?! Hardly any different. Two million years is a tiny span compared with the orbital periods of galaxies in the Local Group. At its current radial velocity, Andromeda gets closer to the Milky Way by about 750 light years every 2 million years. There are a lot of astronomically important things that are, well, visually uninspiring. M31 doesn't have a lot of those nice, eye-popping H-alpha clouds and is fairly low contrast. My favorite images of M31 are from the non-visible portion of the EM spectrum. Actually M31 does have a lot of Ha nebulae, see this Ha image by Paul Beskeen. M31 is also interesting because it contains some Wolf Rayet nebulae and also is home to the first extragalactic supernova to have been observed in 1885 not to mention its double nucleus and many outer tidal tails discovered recently. However I do prefer the nebular content of the LMC and find it much more interesting partly due to the greater presence of OIII emission. starsurfer wrote: Actually M31 does have a lot of Ha nebulae, see this Ha image by Paul Beskeen. M31 is also interesting because it contains some Wolf Rayet nebulae and also is home to the first extragalactic supernova to have been observed in 1885 not to mention its double nucleus and many outer tidal tails discovered recently. I know it has them, but they are not vast and nor do they make the strong impression that some other galaxies do. One must really work at them to get them to pop out in such an image. I want to see objects that have not yet shown. starsurfer wrote: Out of curiosity, what things beside M31 would you want to see on APOD? Me personally would want to see more planetary nebulae and also deep sky objects in catalogues other than Messier and NGC. Well, in this case, you are complaining about a Sunday APOD, and Sunday APODs are always repeats. By design. I did not know that, thanks for the reply . Not constant, but it is fairly regular. Every now and then the weekend days might have new APODs. There are also lots of non-Messier objects, which have never been shown!